The housing market continues to expand, and surprise. According to the National Association of REALTORS®, November’s Pending Home Sales Index gained 3 percent from October. A “pending home sale” is a home under contract but not yet closed. The index is now at its highest point since April 2010’s federal tax credit contract expiration deadline. If the tax credit really did “borrow” sales from the summer months, as has been theorized, housing has rebuilt its foundation. We know this because, of all the housing data available to homeowners and home buyers, the Pending Home Sales Index stands apart as a forward-looking report — its designed purpose as described in its methodology. Because 80% of all homes under contract close within 60 days, and a statistically significant share of the rest close within months 3 and 4, the Pending Home Sales Index is an excellent predictor of future Existing Home Sales data. This is in contrast to the New Home Sales data and Case-Shiller Index, as examples, which both describe the real estate market as it existed two months in the past. 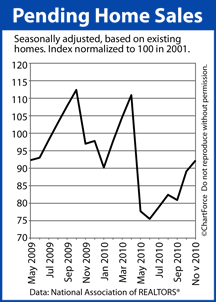 The Pending Home Sales Index reports on housing as it exists right now. We should expect January’s Existing Home Sales report, therefore, to show marked strength, consistent with a housing market recovery. The downside of the Pending Home Sales Index is that it’s a national report and real estate is not sold nationally — it’s sold locally. To get a feel for your home market and how it’s faring, talk to a licensed real estate agent with access to local home sale data. If pending sales data is available, so much the better. Forward-looking figures can be more helpful than data that’s already old.